We’ll be talking all things cat and I’ll be signing books at Reston’s independent bookstore. I’ll be signing books at this wonderful store – come meet me and get your book signed, and shop for healthy foods and unique supplies for your cat and dog. Click here for information and directions. Book signing at Wylie Wagg’s Middleburg location. Click here for information and directions. Pet Autograph Party at the Westchester Cat Show in White Plains, NY (as part of the Cat Writers Assocation Conference). Meet me and 28 other pet writers – a great opportunity to get some holiday shopping done. See above for location and more information. I will be speaking about the lessons animals teach us, and I’ll be selling and signing books. Click here for more information and to register. Book signing at Wylie Wagg’s Falls Church location. Click here for information and directions. I will be signing books as part of Seneca Hill’s Santa Portraits event. Bring your family pet(s) and get their photos taken with Santa, do some holiday shopping and enjoy holiday refreshments. Click here for information and directions. Celebrate Christmas in Middleburg and stop by Books and Crannies to get your signed copy of Buckley’s Story! Click here for more information. Coming to a computer near you: my virtual book tour! Read interviews with and guest posts by me on twelve different blogs. For more information about my tour stops, click here. Just in time for Valentine’s Day! I will be signing books in Seneca Hill’s Posh Paws Boutique. Click here for information and directions. Come join me and Fancy Cats Rescue Team for an event at this wonderful store. The store’s motto is “Inspired by Happiness to Celebrate Life!” Fancy Cats will bring some of their adoptable cats to this event. I’ll donate a portion of the proceeds from all book sales at the event to Fancy Cats. For more information and directions to Seasons Cards and Gifts, click here. Click here for store information and directions. I’ll be signing books at the Seneca Hill Animal Hospital Resort and Spa booth. For more information about the pet expo, click here. Book signing at Vienna Pet Spaw – for information and directions, click here. Vist my booth at the area’s premiere outdoor pet festival. For more information about the Reston Pet Fiesta, click here. I’ll be signing books at Seneca Hill Animal Hospital Resort and Spa’s Open House. For more information and directions, click here. Come join me and Fancy Cats Rescue Team for a book signing and kitten and cat adoption fair. A portion of all proceeds from book sales at the event will go to Fancy Cats. For more information and directions, click here. Visit my booth at the National Capital Cat Show at the Dulle Expo Center in Chantilly VA. For more information about the cat show, click here. I’ll be signing books at the Book Nook at the award winning Waterford Fair, one of the oldest craft fairs in Virginia. For more information and directions, please click here. I’ll be selling and signing books at Red Dog Spa’s 2nd annual Howl-o-Ween on the Green party. For more information and directions, click here. I’ll be talking about the lessons animals teach us, and selling and signing books. For more information and directions, click here. 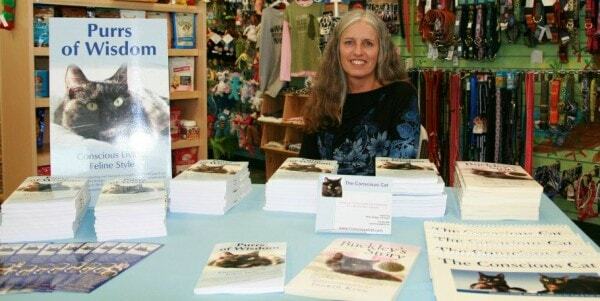 Join me and my fellow cat writers for a book signing extravaganza at the Westchester Cat Show. For more information and directions, click here. In addition to my official signing time on stage, I will also be at the CWA book store at the cat show from 12:30pm on, so please stop by! Just in time for the holidays – get all your holiday shopping for the pet lovers and furry family members on your list done in one place. Autographed and pesonalized books make wonderful holiday gifts! For more information and directions, click here. Join me for an evening of great food and cat themed drink specials at this wonderful restaurant. A portion of all proceeds from book sales at the event will go to Lost Dog and Cat Rescue Foundation. For more information and directions, click here. I will have a booth at the Washington DC area’s premiere outdoor pet festival. I’m excited to welcome special guest Fern Crist, DVM, resident feline veterinarian at The Conscious Cat. Dr. Crist will answer your cat health questions all day! For more information about the Reston Pet Fiesta, click here. I will be answering your questions about feline nutrition and offer purrsonal shopping services to show you how to read cat food labels and choose the best food for your carnivore. I’ll also be selling and signing books. For more information and directions, click here. I will be at the Washington DC area’s premiere outdoor pet festival for part of the day. I will be selling and signing books and answering cat health questions. For more information about the Reston Pet Fiesta, click here. I will be answering your questions about feline nutrition, show you how to read cat food labels and help you choose the best food for your carnivore. I’ll also be selling and signing books. For more information and directions, click here. Come join me for Landsdowne Animal Hospital’s Open House. I’ll have lots of information on cat health and nutrition, and will be selling and signing books. For more information and directions, please visit Landsdowne Animal Hospital’s website. Join me for a a wine and cheese fundraiser at Paradise Springs Winery hosted by Fancy Cats Rescue Team to benefit their ongoing efforts to rescue stray and unwanted cats. Enjoy an afternoon of fine wine, good food, raffle prize drawings, and fun. I will be selling and signing books. A portion of proceeds from all sales will go to FCRT. You must register for this event – tickets are $40 if you register by September 1st. Each registration fee includes price of admission, two glasses of wine, food, and donation to FCRT. Click here for more information, and to register. Join me to celebrate the launch of my new book, Purrs of Wisdom: Conscious Living, Feline Style. I’ll be reading from the book, and selling and signing books. There will be refreshments and cake! For more information and directions, click here. I will be a guest at digital artist Deborah Julian‘s booth at the Columbus Circle Holiday Market in New York City. For more information and directions, click here. Join me for a book signing and discussion. I’ll be selling and signing copies of Purrs of Wisdom and Buckley’s Story, and I’ll be answering cat health and nutrition questions. For more information and directions, click here. I’ll be selling and signing books at this Fundraiser for Fancy Cats Rescue Team. For more information and directions, click here. I am the Learning Ring Sponsor at the National Capital Cat Show at the Dulles Expo Center in Chantilly VA. Visit my booth, and come to my presentation The Conscious Cat: Conscious Living, Health and Happiness for Cats and Their Humans on Saturday at 11am and Sunday at 1pm. For more information about the cat show, click here. Join me for a wine and cheese fundraiser at Paradise Springs Winery hosted by Fancy Cats Rescue Team to benefit their ongoing efforts to rescue stray and unwanted cats. Enjoy an afternoon of fine wine, good food, raffle prize drawings, and fun. I will be selling and signing books. A portion of proceeds from all sales will go to FCRT. You must register for this event. Click here for more information, and to register. I’ll be talking about conscious living for cats and their humans, and selling and signing books. For more information and directions, click here. I’ll be selling and signing books at the Local Authors Fair. Click here for more information. I am proud to partner with Spirit Essences Holistic Remedies for Animals to be the Rescue Cat Sponsor at the National Capital Cat Show at the Dulles Expo Center in Chantilly VA. Visit my booth to purchase autographed books, and holistic remedies. For more information about the cat show, click here. Grand Opening. Click here for more information and directions. Centrally located between Washington DC and Richmond, the Meow Woof Fest will be a celebration of cats and dogs. I’ll be signing books at 2:30pm and answering cat care questions. For more information about the event, click here. Join me to celebrate the launch of my new book! Enjoy refreshments, get personalized copies for yourself and your friends, and mingle with other cat lovers. Click here for directions to Felix & Oscar. I will speak at 2pm, and will also answer your questions – about torties, and anything else you’d like to ask me. Come and support the cats of Feline Foundation of Greater Washington and get some great deals on household goods, pet products, art work, and more. I’ll be selling and signing books from 10 to 12, but the actual yard sale runs from 8am to 1pm. Click here for more information. Cat Camp NYC, the city’s first feline-focused conference and adoption extravaganza, is taking place the weekend of March 11-12 2017. I will be holding a Q&A session in the speakers’ lounge on Saturday, March 11 from 1 to 2pm For more information and to purchase tickets, visit http://www.catcampnyc.com. I’ll be signing books at Orlando’s first cat café. For more information, visit http://www.orlandocatcafe.com. I’ll be at the FelineFoundation of Greater Washington booth from 12pm until 2pm, selling and signing books.